It is probably too early to call it, but I think we can safely say that SureFlap’s Microchip Cat Door is hands down the most innovative cat door or flap that we have in the market today. 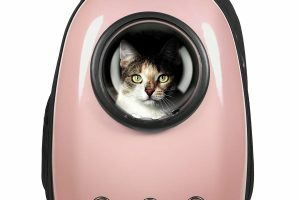 This is a detailed look and review of the SureFlap Microchip Cat Door and while we say that this is probably, easily the most innovative flap of 2019, please bear in mind that this product review is a mixed review of the standard SureFlap Cat Flap, DualScan, and the upgraded model in the form of the SureFlap Microchip Pet Door Connect. By the end of this article, we will also discuss the main differences in the SureFlap Cat Flap, DualScan, and the SureFlap Microchip Pet Door Connect. Most importantly, I will be discussing why they are all in one SureFlap Microchip Cat Flap review. What Is the SureFlap Microchip Cat Door? 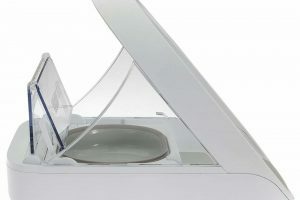 Basically, the SureFlap White Microchip Cat Door is an automated pet door which pairs with your cat’s microchip which grants them access or no-access, depending on the settings that you set on it for your cats. It can accommodate any of your pet’s existing microchip or you can also use the SureFlap RFID collar tag. You get one RFID tag with every purchase of the SureFlap Microchip Cat Door. The very innovative SureFlap dual scan microchip cat flap automatically grants your cat entrance or exit, if you permit them and prevents intruders or other animals from entering your home through the same pet flap. It also has a SureFlap microchip cat flap timer which allows you to set curfews on your cat, on what time are they allowed to go out and when are they allowed to come in. This is probably one of my favorite features because I often forget to lock our old manual flap and I would wake up in the middle of the night and a half to go back down again to lock it. Or worst, I wake up in the middle of the night and I forget if I have already locked the pet flaps or not, and when I go down and find that I have forgotten to lock it, I end up doing a head count of our cats in the middle of the night and make sure none of them went out before I lock it again. Or worst, one of the cats is out and I have to sweat out the whole evening praying they come home safe. With the SureFlap microchip cat door, that is no a problem. The door sends me a message whenever one of the cats goes out, and it has a quick directory where I can check if any of them are out or are inside the house at any given time. Plus it eliminates the guessing game and the forgetfulness factor because I know that at 10 at night and till 7 am in the morning, all my fur family is inside the house, save, and sound. Plus the app lets me be a cat geek by showing my patterns of what time my cats usually go out and how long they stay out before they come back in. The SureFlap dual scan microchip cat flap is battery powered, and the door opening is approximately 120 mm in height and 142 mm wide, so it is pretty big for small to medium cats and even small dogs. 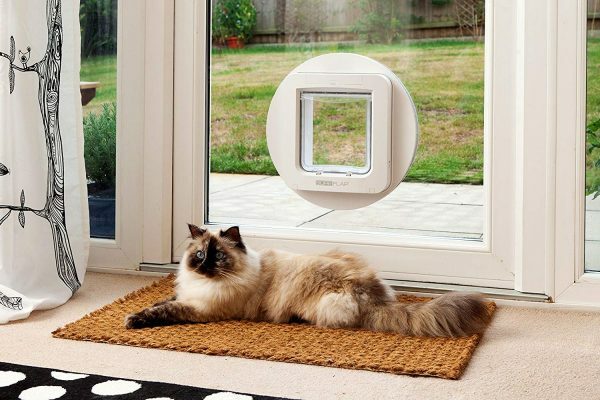 If you have a bigger cat or a bigger dog, you can get the SureFlap microchip cat door which is 178 mm high and 170 mm wide. I also personally love this video review. While I have detailed some of our experience with the SureFlap White Microchip Cat Door especially with the curfew setting, let me also share how we got our cats to get used to the idea of the new, sleek, and futuristic door that they will now be using. According to the Sureflap White Microchip Cat Door instructions, first, we had to download the app, when you first set it up you have to also register your cat’s microchips so that the cat door can detect them and know if they are allowed to go in and out depending on the schedules that you have set. Also, you have to set up the smart hub that comes with the Sureflap White Microchip Cat Door and connect it your WiFi so you can control your door. There is training involve though so be ready. I live in a multi-cat household, and luckily, I know my cats are largely food motivated, so we just taught them that they can get their food on the other side of the glass door if they pass through the SureFlap White Microchip Cat Door. I have to tell you it is oddly satisfying to be at the office on the third day of owning the SureFlap and seeing a notification that one of your cats is already using it to come in and out of the house. 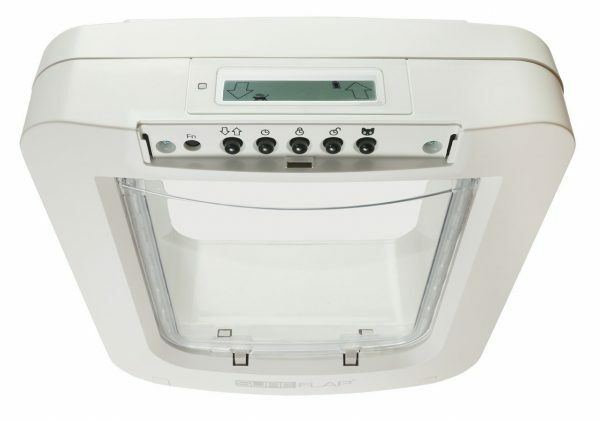 Sureflap white microchip cat flap troubleshooting is quite easy, because of the sleek design and the comprehensive manual that comes along with it. Plus customer care, we heard is very, very good. SureFlap microchip cat flap problems may include issues with cats who are early users of the products, some cats just have a harder time adapting to the new design than others, and my cats took more than three days before they were well adjusted to it. For cat owners that let their cats do the pooping and peeing business outside, there will be additional training involved. My sister has the SureFlap DualScan Microchip Cat Door and a cat that does her business outside be scheduled outings. 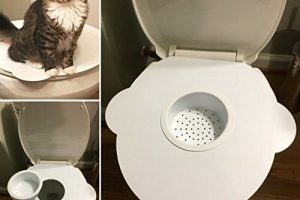 After my sister installed this she just assumed that her cat would go out on her own and just do her business, the poor thing was discovered anxiously waiting by the door at her regular pooping and peeing hours waiting for someone to let her out. They had to retrain her to go on her own whenever she feels like by using the SureFlap Microchip Cat Door. Now we get to the confusing part. Remember a while ago when I said that there is now an updated version of the product which is the SureFlap Microchip Pet Door Connect? Well, because there is. Basically, the “Connect” models are those models which can be controlled remotely or through your WiFi. The older ones that we have are basically the same, but you can’t control them remotely to lock and unlock it. 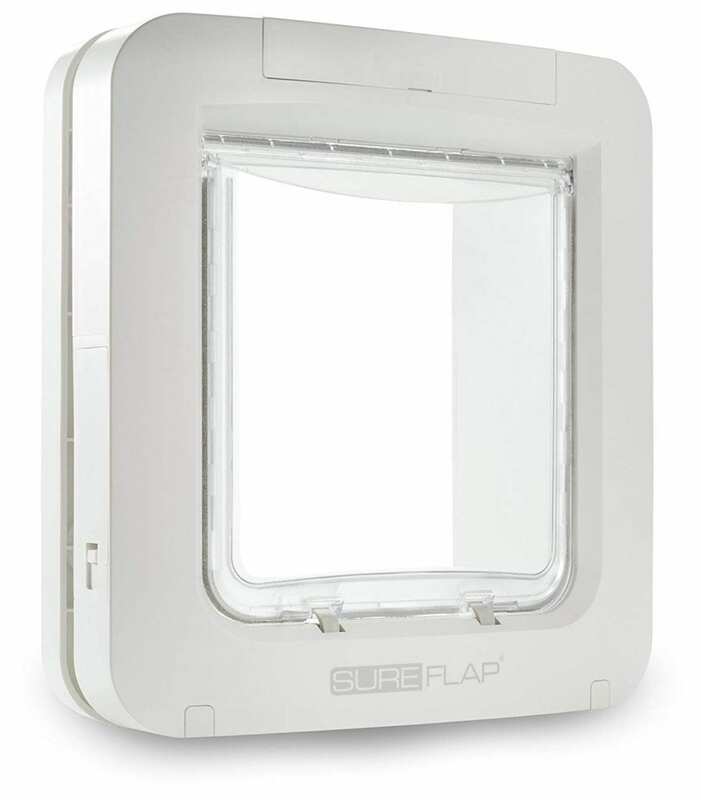 And while the word “flap” and “door” has been used interchangeably in this review, I have to be clear they are two different models the SureFlap Cat Flap is smaller in size while the SureFlap Pet Doors are slightly bigger. 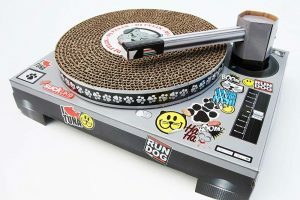 For a full list of the sizes and specifications available you can visit the manufacturer’s website at www.surepetcare.com and also for detail differences. 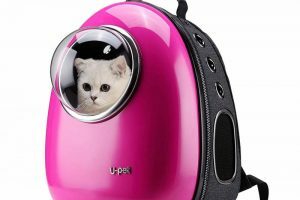 As I said, it is too early in the year to be saying comfortably saying this, but I am quite comfortable in saying that the SureFlap Microchip Cat Door and its series is possibly the most innovative flap to for the whole 2019. I do not see anybody topping the feature pack or the versatility that this line has to offer. We can only nitpick at its weakness at best. Even some of the complains that I have read online from users are bordering on the absurd like racoons being able to come in by tailing their cats and pushing in before the doors locks or something along that line. Will I recommend that you buy it? Yes. 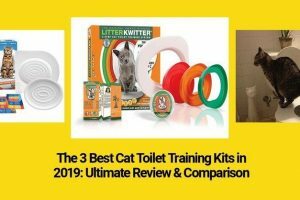 I have loved any and all the products that I have gotten for Sure Pet Care, the makers of the SureFlap Microchip Cat Door. 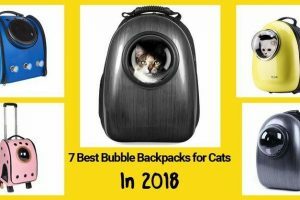 Their innovative products like their SureFeeders are a life changer at home and we have learned to love them because of their safe and reliable cat products. Just make sure to go visit their website and have a detailed look at their table to find which product best works for you and your pets based on their pet door lines. Again, there are just minute or very small difference like door sizes or online options but they can spell the difference between a great product experience and a possible lousy one.